Hi Everyone! 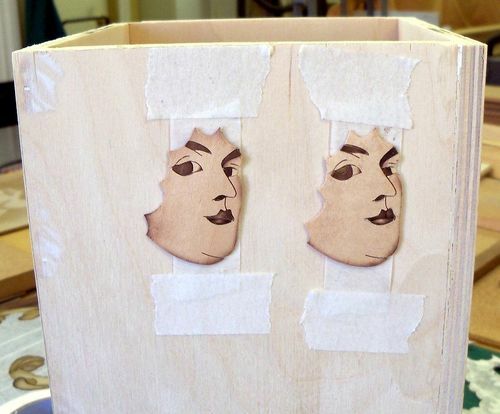 At the rate I’m going … you could all be reading the Marquetry Wine Box Saga into Part 30 by summertime!! ... that’s if you are still willing to read up all about this project!! Maybe I’m too long winded?! I know everyone likes to look at the pictures … so I’ll try to refrain from too much of the verbal stuff. And so to start off Part 4, we take one step back. I had just completed the facial features, then went ahead and sand-shaded the face itself. However, the next day I wasn’t quite happy. Her eyes looked dull ... and so I experimented with the ‘spare’ eye, having the two faces (should something go wrong!). I liked the results and proceeded to do the other face’s eye. The following photos will tell the story. 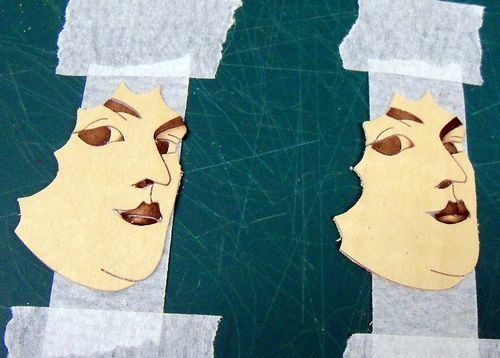 Notice the faces have been sand-shaded now, and the face on the right has the ‘improved’ eye. I know … you have to look hard!! Using the leather punch, I extracted a round from scrap Maple, adequately protected with tape to prevent splitting. Sand-shaded that little piece (the pupil) slightly lighter than the iris. Then, removing the iris from that other face (protected with tape) I again used the leather punch to cut in for the pupil … and slipped the pupil in place. 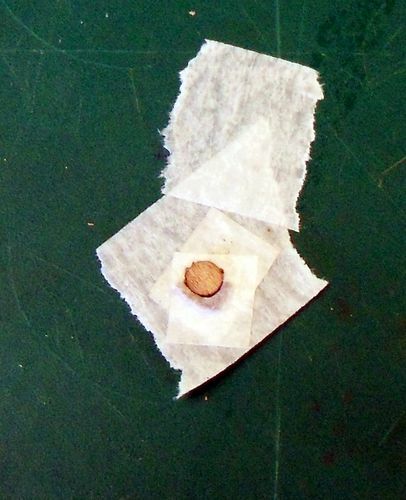 That combination was inserted into the rest of the eye socket, and the excess pupil trimmed off. Using indelible pen I carefully added a touch of dark to the pupil. When this design is ready to be filled from behind, I will use the tiniest drill bit to one spot and apply white filler to completed that ‘sparkle in her eye’ look ... and if I forget to do that, I can always dab a minute touch of white paint when everything is ready for lacquering. But for now I’m happy!! Preservation is necessary! I don’t need to look at this charming face while working the rest of the design. The back is already taped, but now the front of the face is taped as well … and will not be removed until much later. 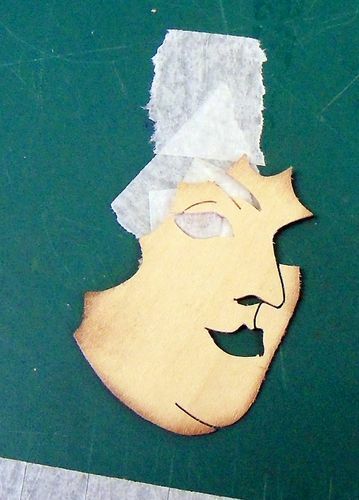 I’m not quite sure what I’ll do with the other face … maybe I’ll make a wine coaster!! Here we go people … into the Window Method for the next little bit! The plus for using this method is that you can play with the direction of grain pattern that will best suit the lay of the design. I was looking (through the window of the template) for a slightly curved grain to follow the contour of her back. Sometimes you want to apply accent lines. Well they are very easy to do! Just scroll saw that line while in the process of cutting out whatever portion you are working upon, then fill from behind with dark filler. 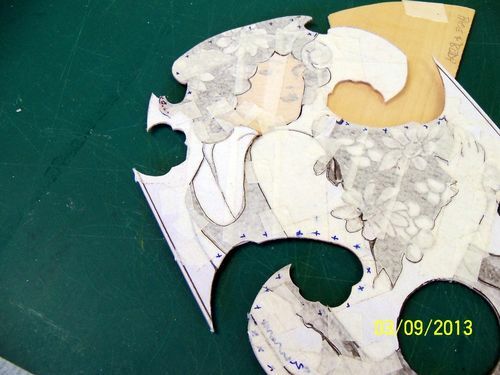 I use a mixture of finely sifted sawdust, white glue and pigments … but we’ll get to that. I don’t want to jump ahead when there’s so much more do be done now!! While in the process of cutting up the template, I also cut into all accent lines. Having found my perfect section of veneer to cut, scribing where necessary (wood to wood) and penciling in the rest of the lines inside the window … I put that section of template back in place, and using my Exacto knife (because it’s easier than squishing a pencil into the line!) ... followed the blade through those accent lines, enhancing that line lightly with pencil … just to remind myself it’s only an accent line not needing exact cutting. Always approach accent lines before cutting the whole piece out. This will help prevent points from breaking off if trying to achieve elongated V’s and such after the fact! And try to start your cut where it will serve you best. You can see where I started at the bottom left, cutting a short accent line in her shoulder … backing out of that to continue along, curving up past one point of the accent line … backing out and continuing up. From where this photo leaves off, I followed around to meet up with that line I started. Most accents are only short lines. 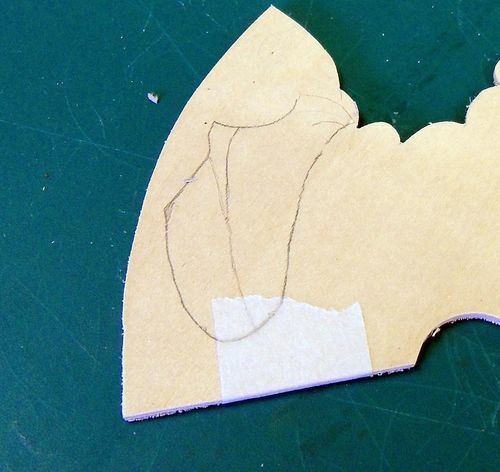 In this particular case I decided to dissected the accented V from the back so I could sand-shade it properly. 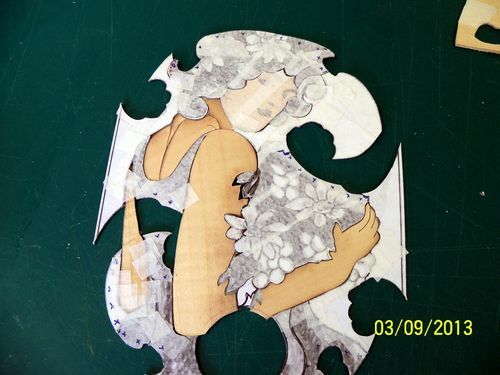 There now … this Nouveau Gal is starting to take shape!! And this ordinary gal is going to take herself off to bed!! I’m really finding it very interesting (and enjoyable!) ... trying to explain my way through the various paths of Marquetry I’ve been taking with this particular project, especially giving thought to what comes next! But as hard as I try to limit speech in favour of photos … there always seems so much to explain!!! So I do thank you all for your continuing patience while following along with me … and acceptance?? for such long-winded narration!! Holy cow how long have you been at this? Your really good. 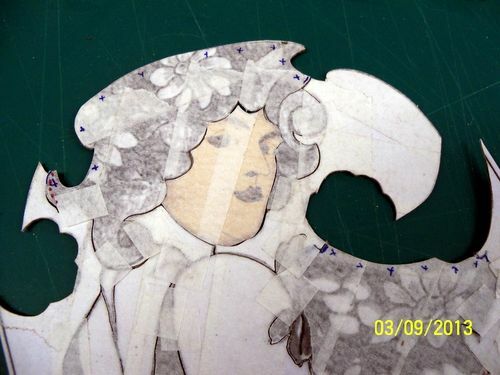 I am beginning to collect veneers and work on tracings I can’t wait to start. Even went out and reassembled my CHEVALET and I’m tuning `er up. Hi Elaine. Yes we like the pictures, but they are always much better when accompanied by explanations of what we are looking at, and when the words are entertaining like yours, that is all the better. So please keep up both. I can’t sleep now as our day time is your night time. That’s why I’m always late in commenting on your blog. Now I am off to the shop. Sleep well. Wow. You certainly have an “eye” for the details! Even I can see you’re making great progress. There’s no way I’d have the patience for this. This is excellent work and presented very well. Congratulations. Elaine, NO you are not long winded! This is like getting a really good book, you should be charging for this detailed information… sharing it is a gift. Just amazing steps, I also would not have the patience, I’d probably just paint it! Looking better all the time Elaine. Certainly worth spending time getting the eyes right. They will draw the viewer’s eye and will make or break the whole piece. By the way, I think you’ve almost nailed them. The final touch with the highlight will take care of the almost . Yes, I agree that this is a very interesting, entertaining and informative read, not boring in the least! Gosh! Many thanks dear friends for such comforting and encouraging comments! I always wonder just how much people want to ‘take in’ as far as explanations go! 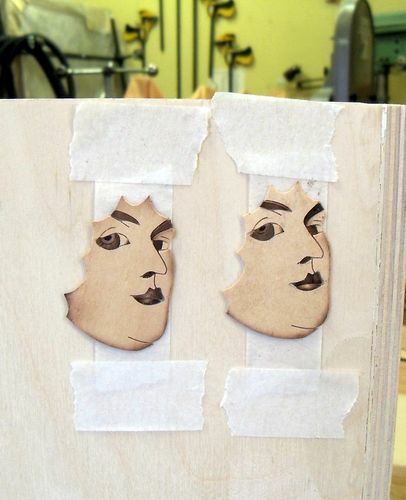 While working a Marquetry project I sometimes feel like I’m all over the map … starting here, leaving off to start there. I’m just hoping my jumping back and forth won’t confuse the issue to the point where you give up watching! 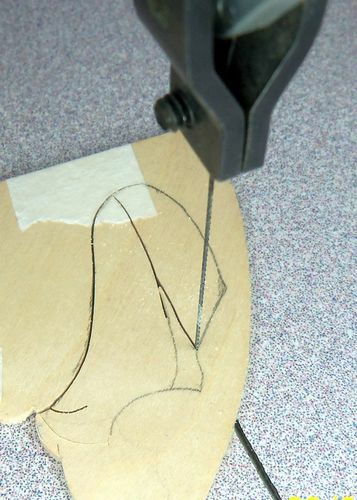 Elaine, thanks for the tip about using a leather punch to cut circles in veneer. 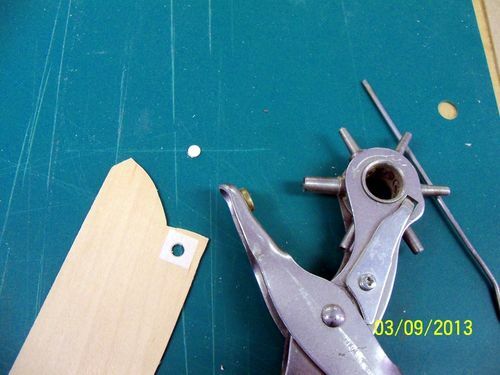 I knew that there must be a tool out there to make this task of cutting small circles easier, I just didn’t know what it was. I am going to have to keep my eyes open for one of those! Your work continues to amaze, and your writing style is just so entertaining…I look forward to seeing what is next. Don’t change the format Elaine. The combo pictures / verbal stuff is well balanced (at least for me). 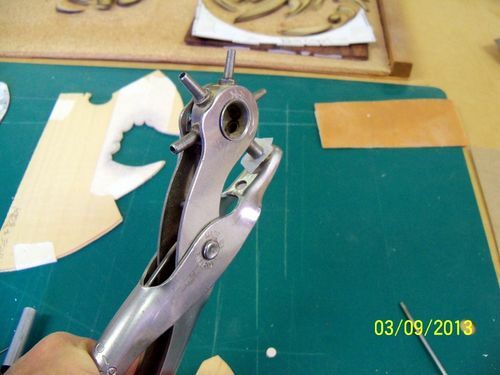 great use of the leather punch. I have 2 of them and only reach for them when the waist line gets bigger. I guess I now have 1 extra tool for marquetry. If you do get “the detailed info” out count me in. I would love to read it. While I might never attempt any marquetry project, at least I can enjoy it vicariously! Thanks for sharing the journey. 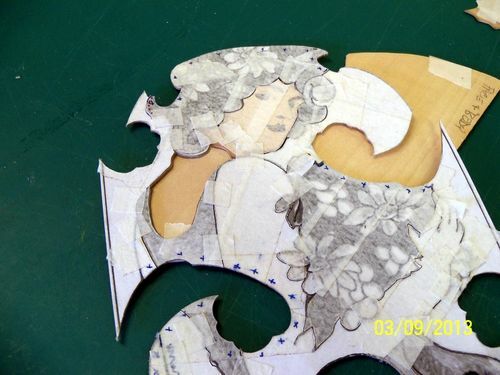 Elaine, this is amazingly detailed and intricate work. It looks greats so far. I look forward to your next instalment. Elaine, sorry for the delay, I have been away and things have been very crazy. You are amazing! This is truly beautiful work. I am really enjoying seeing it all come together. You are making me miss my scroll saw even more (I am waiting for power in the shop still:) ) I am truly inspired by your talent!